Congress created the River of No Return Wilderness in 1980 (renamed the Frank Church – River of No Return Wilderness in 1984). Perhaps the greatest success of Idaho conservationists, it is the single largest designated wilderness area in the Lower 48. It is almost 2.4 million acres in extent, covering a vast array of ridges, deep canyons, glaciated peaks, meadows, and one large rolling plateau – the Chamberlain Basin, which covers 500 square miles. Located entirely in the vast Salmon River Mountains, the Frank Church – River of No Return Wilderness embraces a portion of the largest continuously mountainous terrain in the United States. Over 3,000 miles of trails provide access inside the Wilderness. The area is full of wildlife, especially elk, but also mule and white-tailed deer, moose, bighorn sheep, mountain goats, black bear, coyotes, bobcat, numerous cougar, pine marten, wolverine, a few lynx, and gray wolves. Only the grizzly bear is lacking. Because the altitude ranges from 2,000 – 3,000 feet in the deepest canyons to over 10,000 feet on the peaks, year round range for wildlife is provided. Elk, deer and moose do not need to migrate out of the Wilderness to find winter range. After the death of Senator Frank Church in 1984, Idaho Senator Jim McClure had Congress rename the wilderness the “Frank Church – River of No Return Wilderness” in honor of the late Senator Church’s support for preserving this wild core of the Idaho mountains. This 2.4 million acre wilderness is unfortunately separated from the 1.3 million-acre Selway – Bitterroot Wilderness to its immediate north by one dirt road – the Magruder Corridor. The beginnings of the establishment of this Wilderness came in the 1930s, when the US Forest Service set aside over one million acres through its administrative authority and named it the “Idaho Primitive Area.” Sixteen years after the passage of the Wilderness Act in 1964, the United States Congress established the River of No Return Wilderness from the Idaho Primitive Area, the adjacent Salmon River Breaks Primitive Area and other surrounding roadless public lands. Thirty-six wolves were reintroduced into the Frank Church – River of No Return Wilderness during January 1995 – 1996. As a result, hundreds of wolves now roam this Wilderness, the Selway – Bitterroot Wilderness to the north, and adjacent country. 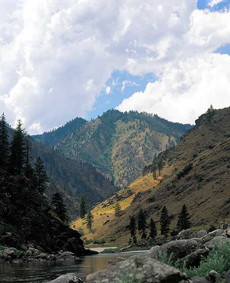 Two Wild & Scenic Rivers – the Salmon and the Middle Fork of the Salmon – flow through the Wilderness. Both rivers are popular with white-water kayakers and rafters. The headwaters of the Wild & Scenic Selway River lie in the northern-most part of the Frank Church – River of No Return Wilderness. The Wilderness covers parts of numerous National Forests, including the Bitterroot, Boise, Salmon – Challis, Nez Perce – Clearwater, and Payette National Forests. With the additional exception of a few popular high lakes areas and the two river corridors, most of the Wilderness sees very little human use except from hunters in the fall. In spite of its size the area has many threats. Motorized jet boats are allowed to mar the silence on the Main Salmon River. Numerous landing meadows see airplane traffic. The Idaho Fish & Game Department wants free reign to turn the area into a game farm by using helicopters to capture wildlife. Three illegally built lodges on public land along the Salmon River are still there because a last-minute, underhanded maneuver in Congress overturned a court order which required the lodges to be removed. Wilderness Watch is working to close four unnecessary (illegal) airstrips - 2018. Wilderness Watch and others successfully challenged Idaho Fish & Game’s game-farming project – 2017. Wilderness Watch and others oppose wilderness areas being opened up to mountain bikes – 2018.